Are You Sleeping With Ward Cleaver? 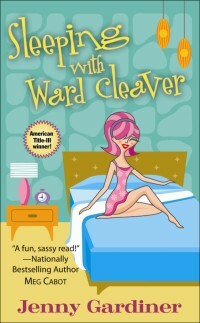 Deb Jenny’s book Sleeping With Ward Cleaver debuts this week! Jenny will tell you that Sleeping With Ward Cleaver is not exactly a romance. I loved the idea of this book as a romance — not a romance novel — but a romance. Most chick flicks and romance novels end just as the relationship is beginning, when everything is fun and tingly and simple — Long before the dryer catches on fire, the kids vomit ketchup on the new bedspread, or you hear the wild and crazy Spam merger story for the 419th time. I think when a lot of women think romance, they imagine George Clooney, or that hottie guy they dated in college – not their husbands. I thought this was an interesting idea. Who among us sees our husband snoring away, slurping his minestrone, or clipping his monster toenails and thinks, “mmm, now that’s my kinda man!”? Often, we don’t notice what we have until it’s in danger of slipping away. But it occurs to me that no one looks at their husband or wife in the beginning of the relationship and thinks, well, you’re annoying as crap, but I guess I’ll marry you anyway. We start out in love. When we first fall for someone, we see all of the good things about our partner, their possibilities, all the ways they fit with us. After we’ve been together for awhile, their flaws start piling up, like the dirty socks they leave by the bed. I think the idea of finding love in your own marriage is inspiring. And you need not look any further than the snoring spouse, drooling on the pillow, on the other side of your bed. Thanks for pointing this out, Lisa. Interesting concept, this mid-marriage romance – it also makes you redefine what actually IS romantic. I don’t get flowers too often anymore, but I do get breakfasts cooked for me at least once a week. I may not get taken out to the theatre so often, but I do get driven all over hell’s half acre because I’d rather be a passenger than a driver. And I may have to bend down and pick up dirty socks (that aren’t mine) and deposit them in the hamper, but I never have to actually do my own laundry. THAT’S ROMANCE. My husband always brings me his dessert whenever he eats out for business, does the laundry, and more important than anything, believes in me completely. I love this post, Lisa. I found Jenny’s book romantic too, in a totally different way than the traditional romance. Love your comments too, Joanne. Lise, that was so sweet! I have always been so fascinated with relationships and how they can turn so sour. I mean, usually friendships mellow with age, but marriages? Not so much. What is the component that changes so dramatically? Having watched my parents’ relationship and observed what a fine line there must be between love and hate, it seemed a natural progression to some day explore this idea in fiction. I had no idea this was how I’d do it, but hey, it actually happened! I know I’m loved when I go out to leave for work in the morning and Bob’s already scraped my car windows. sigh. I love that guy. Scarped windows does it for me!! And I agree this is a GREAT post about Jenny’s book. Just perfect!! Scraped windows are the best! Tom used to scrape my windows when we lived in Minneapolis. Now we live in Florida — no ice!! You’re so right. My father in law once said to me, when I was a newlwed, “Easiest thing in the world to get married. Hardest thing in the world to stay married.” I think we’ve all given our husbands the occasional “mercy Fill-in-the-blank”. Jenny’s approach to Romance was so true to life and fun it make the book a pleasure to read. And thank you to Jenny for including me in her acknowledgments. Is this “romance” being discussed or is it the real deal known as love? I think the latter — which is SO romantic — and maybe what too many don’t understand! Larramie, you are right, it ultimately is a love story. And nothing more romantic than sustaining love, is there? Romance is wonderful, and so much fun. But mature love, the kind that only comes with time and all of the not so fun experiences of marriage and child rearing, is the strength of a relationship. How wonderful it is when we can recognize the romance of scraped windows, laundry, etc., in our mature relationships and appreciate it. Great perspective, Lisa! And great cover shot on Woman’s World magazine! Congratulations, Cover Girl!